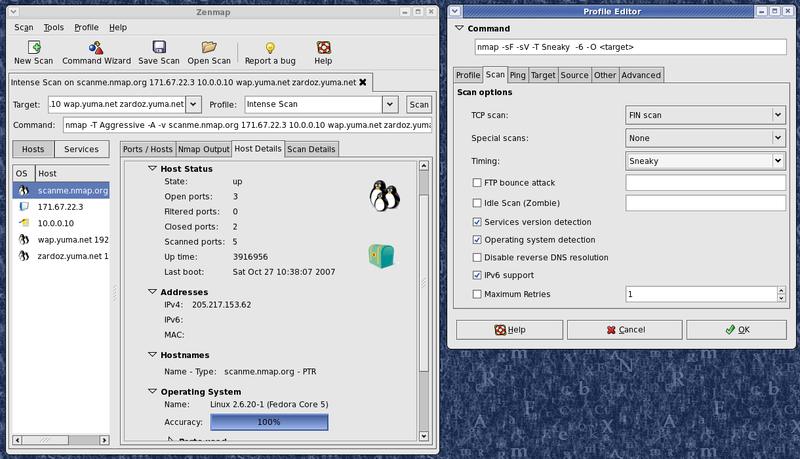 This article introduced Nmap to the world in September of 1997. Obviously Nmap has changed dramatically since then. So if you aren't here for historical purposes, read the current docs at the Nmap documentation page. initial  bits of the 32 bit IP address. advised to check there right now. people who made it possible. * Congratulations to the people at Phrack for getting this thing going again! * Greets to the whole dc-stuff crew. groups who help keep the scene alive. * Shout out to _eci for disclosing the coolest Windows bug in recent history. Monies, Ethernet Kid, Zos, JuICe, Mother Prednisone, and Karen. This should compile fine on any Linux box with 'gcc -O6 -o nmap nmap.c -lm'. have problems or comments, feel free to mail me (fyodor@dhp.com). fprintf(stderr, "Your argument to -b is fucked up. Use the normal url style:  "
"user:pass@server:port or just use server and use default anon login\n  "
fatal("If you want me to fake your argv, you need to call the program with "
"a longer name. Try the full pathname, or rename it "
printf("Initiating UDP (raw ICMP version) scan against %s (%s) using wait "